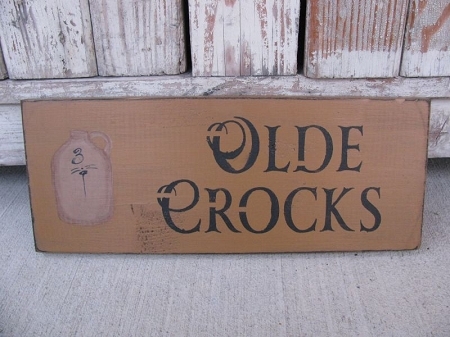 Primitive Olde Crocks stoneware crock jug hand painted sign. I love old crocks and stoneware, I've collected them for many years. Such a staple in Primitive decorating. 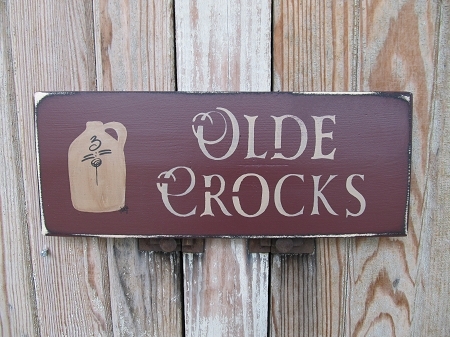 Why not have an sign that looks old, and features your collection or one you hope to have. Featured in the August 2014 Country Sampler Magazine. This sign can be customized in some color options. Shown in Olde Forge Mustard. Second Image is shown in Black. Size is 14"x 5 1/2" pine wood board. Hand painted by Heidi.